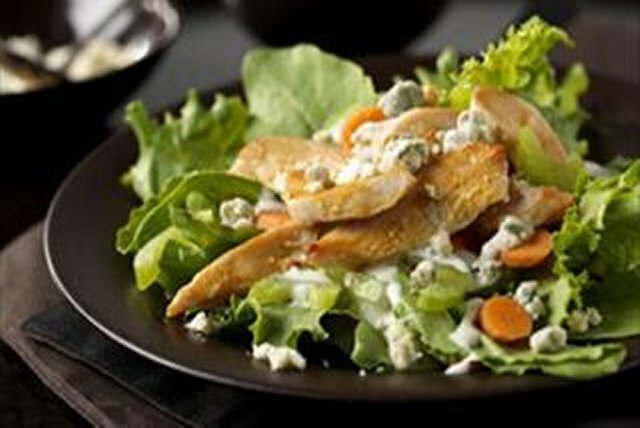 Cayenne pepper sauce, sliced celery, creamy ranch dressing and crumbled blue cheese give this easy 15-minute chicken salad its Buffalo-style appeal. Heat large nonstick skillet on medium-high heat. Add chicken; cook and stir 4 to 5 min. or until done. Stir in 1 Tbsp. pepper sauce. Cover platter with salad greens; top with celery and carrots. Drizzle with dressing. Top with chicken, cheese and remaining pepper sauce. Omit the blue cheese and prepare using Kraft Crumbled Blue Cheese Dressing.